How do you make language come to life on the stage? What are writing basics and techniques for the dramatic medium? Learn how to bring your fiction or non-fiction stories to life in a way that connects with your audience. Saturday, April 16 at 10 a.m.
Spring has sprung; the grass has riz! I wonder where the flowers is? Okay, so I'm not a poet, like our Maurine Killough, or our celebrated Senior Poet Laureate, Jo Carpignano, but in my own way I celebrate this season by writing about it. How about you? And, what can you tell about me from just those few lines? Obviously, I was not raised in California, where flowers are blooming year around. That's one! Also, I'm not afraid of taking risks with the use of language. How about you? Because it is April, I am hoping many of you have already submitted your polished composition to the San Mateo County Fair, (Deadline: March 31) so you've been busy writing! That's what we are here to do. What other kinds of writing are you doing? Are you entering other contests? Writing poetry along the beaches? Brushing up on your manuscript for the 33 rd time? Remember: All writing is good! I heard it relieves pressure from the brain by lifting tiny little brain feathers! No matter! Enter into the fray of writing with wild abandon! Kick up your feet, click your heels, take another Advil, and settle into writing about the world on your minds! Spring is here! Speaking of your manuscripts, have you found yourself stuck in the middle lately, and don't know how to proceed? Have you been staring at too many blank pages lately? Are you totally in the dark when you hear the words 'beta readers' and are wondering if you first missed the lesson on 'alpha readers'? Are you needing a little help? This month of April, we are hoping to open the doors to an updated 'Mentoring Program'. 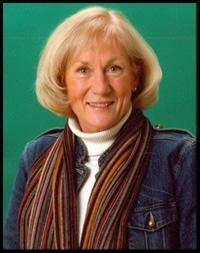 Past-president Geri Spieler is busy staying up nights pulling the pieces together to bring an old program back to life. Do you have an interest in helping out? Would you like to be a mentor? Or, do you feel like you could use a dose of good mentoring and a league of 'beta readers'? We will be taking names. We are also hoping to re-institute our Critique groups. (I know; we have been talking about this since last Fall, so what gives?) We will be taking names to begin to form the groups at this coming general meeting. If you have been in a critique group before and want to help out, please let me know. If you are new and wanting to join a group to get to know others, this is your moment. Have you been itching to read a few pages of your latest work? Please get yourself over to Open Mic, which is the 3 rd Wednesday of every month at 7:30 p.m., which would mean this April 20th. It's held at Reach and Teach, 144 West 25 th Avenue, in San Mateo. And, for a special treat for our April general meeting, our own Sam Kauffman, who has written, performed, and composed the music and lyrics for over 16 one-woman shows, will be with us for our monthly meeting, April 16th. A singer, songwriter, actress and recording artist, she is known for her storytelling ability and her memorable lyrics. We are definitely in for a treat! 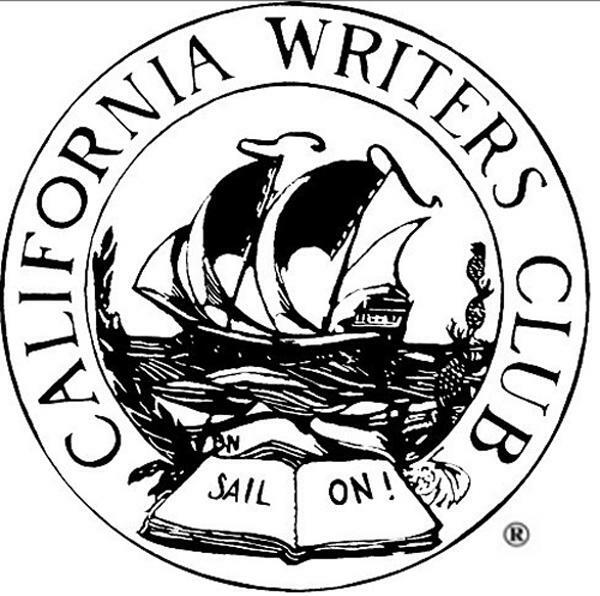 CWC President, Carole Bumpus, was asked to speak to the Montalvo Arts Center League - for their Spring Luncheon, March 28 th on "How I Left My Role as Family Therapist and Embraced a new Role as Novelist and Travel Writer in Four Easy Moves (across country)." Rogue CWC member (now living in Florida), James Hanna has good news on several counts! His story "The Body in the Bay," which depicts a true incident that happened to him as a San Francisco probation officer, just came out in the spring edition of Red Savina Review . Jim also has an interview recently posted on the Facebook of Word Slinger Publicity. His other story about his probation officer days, "Jimmy Likes Mermaids," has just been published in The Artist Unleashed. This is a creepy little tale about a stalker he had to bust. And last but not least, Call Me Pomeroy just came out in its third edition. The book includes two new Pomeroy stories and is now the size of a full length book (190 pages). Lucy Ann Murray has started writing a series of 21 articles on the 20 regions of Italy. The articles will be published in three Italian American publications in Chicago, Boston and Las Vegas.The first article appeared in the March issue of all three magazines. She will write six articles per year over the next 3 1/2 years. Nanci Lee Woody has GREAT news! She was interviewed by Beth Ruyak of Capital Public Radio's Insight program. Click here to hear the interview at Cap Radio for March 9 under "programs" and "Insight." 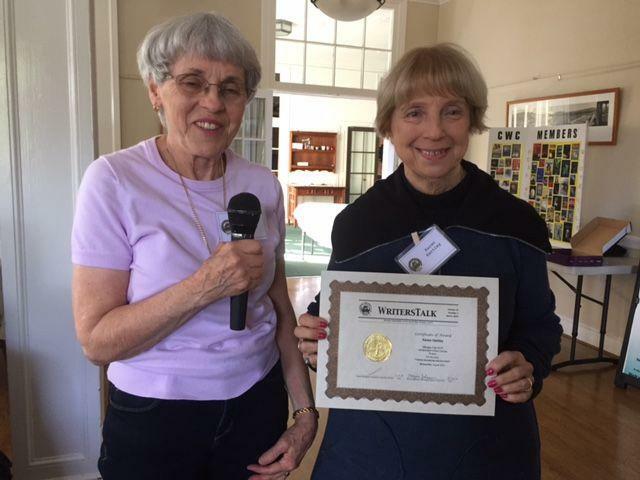 Poet, Karen Hartley, was awarded with the Critics Choice Award at the March CWC Program by the South Bay Writers Club for her work which appeared in Fall 2015 WritersTalk, She received a certificate and a gift card for Barnes & Noble. Maria Barr put the final period to her novel, "Stolen Glory of the Californios" which she has been writing for two years. In the process of writing her story she have traveled to San Diego to reconnoiter the area where the Battle of San Pasqual happened. At the battlefield museum she was given information that introduced her to Los Ante Pasados, a group of the descendants of the early Californians--the very people she was writing about! In in the process of writing her book, and through her effort of putting pen to paper she has discovered a new world of people. 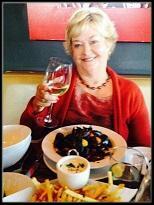 Karen Hartley seeks an experienced screenwriter. Contact her at: sew1machin@aol.com or (408) 315-0271. To celebrate Poetry Month below is a poem by Karen Hartley.